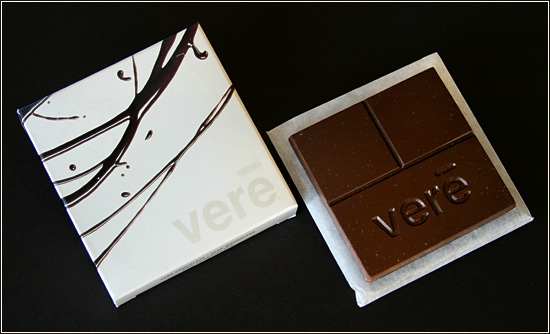 Vere Chocolate (pronounced very) is fair wage, organic, sustainable, certified, vegan and a bunch of other good stuff. In a time when even Wal Mart has jumped on the “organic” bandwagon (which seems a little dubious) any of these could be considered the marketing spin d’jour, but added together and in conjunction with the attention to detail lavished on design it suggests the company is going far beyond the common way to produce chocolate you can feel good about while you revel in your violation of that commandment about gluttony (It is better savored in small doses but if you have to eat a lot of something this is probably more pure than the air you’re breathing). This attention to quality is hard to mass produce which makes obtaining it from their New York shop harder than hitting the vending machine but honestly would you want it any other way? Vere makes many different chocolate delicacies but I’ve restricted myself to dark chocolate bars. This one is 75% cacao, low sugar and contains a grand total of five ingredients so it’s fairly stiff and simple. It is also pretty unique in your mouth. It has a slightly bitter aspect but isn’t in the least bit heavy or oily and has almost no after taste. For some reason it reminds me of water – refreshing, but not in that horrible, artificial, minty, way tooth paste companies mean. You could almost use it to cleanse your palette which is rather remarkable and a very interesting parallel to the packaging. The square box containing two stacked bars is a delightful change from the typical rectangular configuration and the company’s earth and body friendly philosophy is further evidenced by the absence of plastic or foil. The minimalist, stark white box adorned with the simple vere logotype serves a thoughtful counterpoint to a dash of chaos in the form of chocolate drizzled the way a chef in a fancy restaurant would put it on a plate containing an agonizingly small slice of the kind of chocolate cake that will keep you up all night. The bars themselves are great fun too (divided in half with the top divided in half again) they are evocative of the golden ratio, except yummier. What is also interesting is that owner Kathy Moskal was and is deeply involved in developing and implementing the creative approach throughout the company. She collaborated with designer Brigid Kavanagh who also worked with Kathy on the creation of packaging for legwear company Hue and is now busy working with New York’s MoMA and Chilewich. Victor Schrager provided the photography and with any luck got stuck with the delicious task of cleaning up. 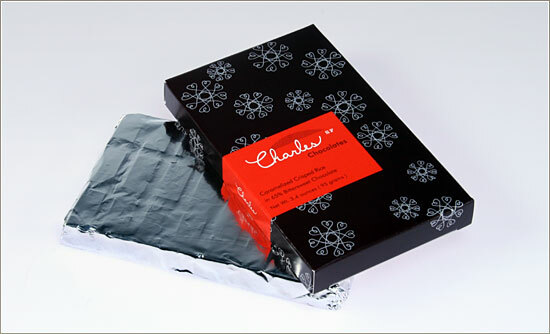 The website is similarly clean and straightforward letting the chocolates play the role of hero. There are a few break downs in the CSS that an impending redesign will fix. But don’t wait to take a spin through the site to learn more about the company’s philosophy. You’ll see that design plays an integral role. 03.23.2010: It looks like the Vere is no longer making Chocolates and the website is now dedicated to another, non-chocolaty product line. The organic and fair trade certified, 75% cacao Ivory Coast bar has a rich, roasted, vaguely fruity, flavor that compliments the packaging nicely. When you pause to consider the flavor it keeps changing on you. Kind of exciting really. It’s smooth but not cloying with a pleasing bit of texture that a mega-factory process would eliminate. The only drawback is that the bar breaks into only six segments which makes it harder to part with one. But, your friends will thank you if you do. Logo and packaging designed at Kitten Chops in Seattle by Marta Windeisen who coincidentally goes by the name Zaara. Judging by her lush illustrations she was influential at Starbucks where she worked for five years. She wrapped each of four different bars in paper wrappers with rich, warm, painterly, abstract designs adorned with simple hand lettering. A nice change of pace in a field that often can’t resist ornate, gold foil, swooshiness in an attempt to look fancy and historically significant. The website Design by Seattle’s Design for Wine and Food is not of the same caliber as the packaging I’m sorry to say, but it does at least provide a little insight into Theo’s deal. We’ll have to hope they let Zaara illustrate and art direct the next version. This bar is Caramelized Crisped Rice. They don’t snap, crackle and pop but they’re still crunchy and make for a novel texture. 65% cocoa is enough to make the back of your tongue tingle but not too steep for the uninitiated. It’s good, smooth cocoa and comes in a cool box and interesting flavors which makes it a good one to give as a gift or bring to game night. 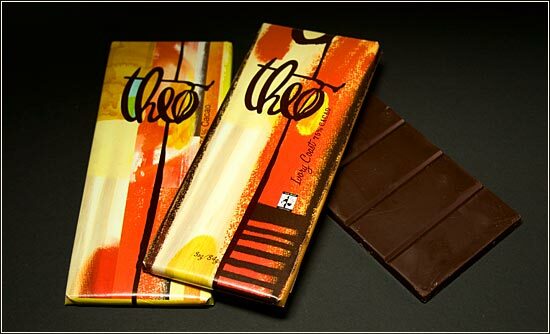 Each bar in the collection is wrapped in chocolate brown with a different line drawing and color box. Nice and simple it has a sense of whimsy while also providing a usable system for recognizing your favorite at a glance. It doesn’t try to be fancy, just humble and stylish. The box is pretty handy if through some minor miracle you don’t eat the entire thing in one sitting. Templin Brink Design in San Francisco did the design work. The office has since split up and now Joel and Gaby do work as Hatch Design and Tomorrow Partners respectively. Both have portfolios full of fantastic work. The website is not quite as clean and fun as the packaging but it’s not way off base and is pretty usable. Available in Minnesota at Corazon (Washington Avenue or Lake Street). Find other locations here.